I chose to use the Hypnobabies method to be able to birth my twins naturally. 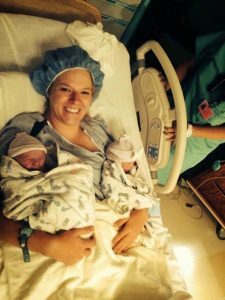 I didn’t always want a natural birth, ESPECIALLY once I found out I would have to push two babies out… I was like … nope! Through my dear friend Rachel and some spiritual promptings, I stumbled upon a Hypnobabies class taught by Talya M. Hypnobabies teaches self-hypnosis to re-wire the way we view birthing to a very positive thing and it teaches deep relaxation and how to use real hypno-anesthesia. It also teaches very detailed and accurate information on the birth process and what our bodies can do! I soaked up every ounce of information like a sponge…it was exactly what I wanted to hear, and it felt good! By the end of the course, I was craving a natural birth and had so much confidence in myself and my body! Thank you, Talya! After dinner, I was supposed to go to a wedding reception with Jordan, but I felt a huge desire to sleep and a prompting to listen to my body, so I fell asleep and Jordan went to the reception. I slept for about 3 hours, woke up at 9:00 pm, and waddled myself to the bathroom. While on the toilet I felt a big shuffle come from the babies followed by a slow and somewhat constant trickle. I thought, “um? That was not pee… Wait…” Yyyyyep my water broke, and I knew it! I sat there wondering why I hadn’t felt any pressure waves (Hypnobabies word for contractions) and if they would start. In the meantime, I just sat there and texted Jordan. I knew that would result in some sort of hyper-reactive tornado that is Jordan, but I needed him home because I was a little bit in shock. I also texted Talya, my doula, to let her know things were starting. Then I called my mom for some comfort before Jordan got home. I was still just sitting there when Jordan got home. Sure enough, I was bombarded with excited questions… “Are you sure?” “Why is so much coming out?” “Are you ok?” “What do I do?” “CALL THE DOULA” haha… I reminded him what we learned in class and that this is normal and calmed him down a little. I called Talya anyways and she suggested to lay down and get some rest before things started picking up and to send Jordan to get some pads, so I didn’t soak the bed. Haha…Jordan knew what pads were from being a husband, but I had to explain that I needed the big absorbent kind this time. He ran out the door and came back with the biggest pads I had ever seen!! They were just short of being a diaper…I laughed and told him thank you…But they ended up being just what I needed. I kept packing and they kept coming until I finally realized the pressure waves were coming faster than they should if I was in my early birthing time. I started tracking them and they were already about 6 minutes apart and lasting 30 seconds to a minute. At 10:40 I texted my doula and let her know that things were picking up and I didn’t think I could sleep through the waves. She encouraged me to listen to my body and get into hypnosis. I tried laying down to listen to my hypnosis tracks but man my body did not want to lay down! I decided to sit on my birthing ball and listen to my Deepening track (Hypnobabies hypnosis track to deepen level of hypnosis). Ten minutes later I realized the waves were pretty intense and I couldn’t talk through them. I wasn’t completely able to tap into my hypnosis tools right then because things were moving so fast so I was getting anxious for Talya to come over, but I figured I still had like 15 hours left of my birthing time, so I didn’t ask her to come yet. Ten minutes later though I texted her that I was having a hard time relaxing on my own and she called me and talked me through a few pressure waves with hypnosis. Her voice was so calming, and she said everything I needed to hear to remember my hypnosis tools I had been practicing. I was able to be very relaxed and much more comfortable after listening to her prompts. Where was Jordan during all of this? On a packing rant… He even came in to ask me if he could run to Walmart to buy a head mount for his GoPro and some canned soup… I gave him an exasperated and curious look and said, “no I need you here” and he kicked in and sat with me till Talya got there. I spent the next little while awkwardly waddling around trying to find a position that my body would agree with while Talya made me feel very calm and relaxed. At about midnight I threw up and boy did that feel good! When I was throwing up, I remember thinking, “don’t people usually throw up when they are in transformation (Hypnobabies word for transition)?” I still really didn’t think I was that far yet… Talya soon pointed out that my pressure waves were every two minutes now and asked if I would like to go to the hospital yet. We pulled up to the ER entrance and a nurse rushed out with a wheelchair to greet us. I didn’t hear her, but Talya told me later that she told the nurse I was ready to push! She rushed us up to the Labor and Delivery unit and turned us over to those nurses. The L&D nurses must not have thought I was that close (I was very calm and comfortable) because they were not acting rushed at all. They asked us a few questions and then sent me to triage and they told me to put on my gown and then get in the bed where they will check to see how dilated I was. I just did as I was told, but as soon as I went to change into my gown I felt a huge overwhelming need to push my baby out! I told Jordan and he proceeded to run back and forth between the bathroom where I was to the nurses’ desk outside yelling, “CAN I GET SOME HELP?” Finally, the nurses felt some urgency and walked me over to one of the delivery rooms. Somehow, I got changed into the gown and in the bed and the doctor who was on call checked my dilation and announced I was complete….no duh… I got really excited when he said that though because the only pelvic exam I had was the last one 🙂 and I was so so excited to meet my babies! I was pushing during all of this with each pressure wave and the doctor told me not to push until we got to the operating room… Uuummmm FYI it is impossible not to push… But he is a man and could not possibly understand, so I forgive him for making the comment. (We had to go to the operating room because of hospital policy that every mom with multiples has to deliver in there) Pushing felt so good! I loved actively working with my body rather than trying to relax and let it do its thing. We finally made it in there and I chose to push on my knees. Talya was not allowed in the OR so it was just me and Jordan working together. This is something I will cherish for the rest of forever 🙂 he held me and said little prayers with me and told me how amazing I was doing. I was pushing for 40 minutes. Those were arguably the best 40 minutes of my life. It was a little weird because there were so many nurses in the OR watching me… I looked around at one point and saw a small crowd of nurse faces watching me from a window… I didn’t know what to do so I just smiled at them. They didn’t know what to do either and awkwardly smiled back. I was in the zone for most of it though and wasn’t aware of my surroundings at all. Jordan said lots of nurses in the room were talking to each other about how well I was handling everything by using hypnosis. I felt no pain but felt every sensation from both babies coming down and crowning to both babies slipping into this life. I pushed my baby boy out first 🙂 it. Was. Amazing! I did it!! I was so happy and proud of myself and feeling him come out was surreal! I was facing backward so I had to turn around and sit normally to hold him 🙂 he was softly crying and so beautiful! The doctor let his cord pulse a little bit before he had to clamp it and get things ready for baby girl to come out. I handed him to Jordan and then assumed the normal “pushing” position so the doctor could see what baby girl was doing. She was a little angel and was still head down. The doctor suggested we break her sac so she would continue to come down quickly. I was against the idea for a second but I felt very at peace with it and agreed. I didn’t have time to get back on my knees because she was coming! After 9 minutes and two pushes, she was here! I could see her and she was blue but she quickly took a breath and pinked right up. She was very quiet and just enjoyed me telling her how much I loved her. A piece of my placenta wouldn’t come out so there was a bit of craziness while they got that out… But eventually I got both babies in my arms, kisses from Jordan, and the happiest feeling I can’t even describe. I still can’t believe I did it 🙂 we finally left the cold operating room and went back to the regular room where I got both of my babies to latch and nurse at the same time! Our family was finally together and everything was perfect.